Great Dane Characteristics (German Mastiff): The self-assured and steadfast Great Dane is a breed of Giant dog classified as a member of the Working Dog Group (AKC:1887). The Great Dane, is characterized by its massive, sleek appearance with a majestic, alert expression. Other characteristics include light colored, medium sized, almond-shaped eyes; high set, erect ears; a thick, tapering tail and a fluid, effortless gait. The temperament of the Great Dane can be described as Confident, Devoted, Friendly. The coat type of the Great Dane is described as short, thick, glossy coat in assorted colors. Due to its characteristics and qualities, the Great Dane demonstrated the desired traits of a Watch dog and Hunting Dog and is known by its nick name the "Gentle Giant" or its alternative name the German Mastiff. The origin of the Great Dane dog breed was in Germany where it was developed in the Middle Ages. 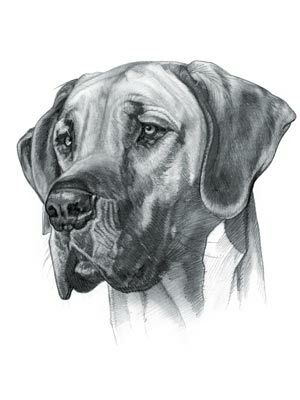 Great Dane Breed Group and Dog Type - Working Dog Group (AKC:1887): The Great Dane is one of the many breeds of dogs that belong to the Working Dog Group (AKC:1887). Origin of the names: The name 'Great Dane' implies a connection with Denmark, although this was not its country of origin. The name "Grand Danois" translated as "Great Dane" was given by the French naturalist and dog lover Comte de Buffon (1707 – 1788) during his travels in Denmark. The breed was first commonly referred to as the German Mastiff. Great Dane History and Origin: The ancestors of the Great Dane are the massive, ferocious Molosser dogs of antiquity and the, now extinct, Alaunt breed. The name "Molosser" reflects the name of King Molossus, the grandson of the great Achilles of the Trojan War, who ruled the ancient Greek tribe of Molossians in Epirus, Greece. Dogs resembling the Great Dane can be seen in ancient Greek art in architecture (stone carvings) pottery and metalwork. The country of origin of the Great Dane breed was in Germany during the Middle Ages. This powerful, muscular dog was developed primarily in Germany and England as a crossbreed, by combining the speed of the Greyhound, with the power and strength of the German boarhounds and the English Mastiff. The Great Dane was originally bred as an improved type of Boar Hound. The ferocious, massively built wild boar had four sharp tusks used for fighting off predators and could inflict severe injuries to a Great Dane, especially after a powerful charge. These courageous, elite dogs were owned by noblemen and shared their exclusive lifestyle living in castles and were referred to as 'Kammerhunde', or Chamber Dogs. The Great Dane is the biggest dog in the world, the size of a donkey. According to the Guinness World Records the world's tallest dog, the Great Dane, measured 111.8 cm (44 in) from foot to withers (the ridge between the shoulder blades). The Great Dane was officially recognized by the American Kennel Club (AKC) in 1887. Great Dane Modern History: The modern history of the Great Dane moved on from its primary function as a Boar Hound and the breed is now used as a Watchdog, Guard Dog and family companion. It's history as a Chamber Dog made this transition easy. The Great Dane was designated the official state dog of Pennsylvania in 1965. Great Dane Modern History - Scooby Doo: The famous cartoon character Scooby Doo that began in 1969 is based on a Great Dane. The famous catchphrase of the lovable Great Dane in the TV series is "Scooby-Dooby-Doo!" The American voice actor Don Messick was the original voice of Scooby-Doo from 1969 until 1997. Great Dane Height: The Great Dane breed is classified as a Giant sized dog. The height to the shoulder of a male dog is 30-34 inches (76-86 cm). The height to the shoulder of a female dog is 28-32 inches (71-81 cm). Great Dane Weight: Not surprisingly for a Giant sized dog, the weight of a male dog is 120-200 pounds (54-90 kg). The weight of the smaller female dog is 100-130 pounds (45-59 kg). Great Dane Coat Type: The coat type is described as a short, thick, glossy coat. Many Great Danes have a Melanistic Mask (a dark coloration of the skin or hair typically on the muzzle and face of the dog) because of a high concentration of melanin. Great Dane Coat Colors: The colors of the Great Dane dog breed consist of assorted colors consisting of Black, Brindle, Blue, Mantle, Fawn and Harlequin. N.B. Brindle is a brownish or tawny color. The word "Blue" is used to describe a cool-toned, metallic gray color. The 'harlequin' term refers to a dog that carries genes that cause most or all of the "blue" to be replaced with white, leaving a dog that is mostly white with black patches. The Great Danes with 'Mantle' colorings have a "black blanket" over a pure white base coat. Great Dane Grooming - LOW Grooming Needs: The dog grooming needs of the Great Dane are categorized as Low in order to maintain a healthy coat and reduce the risk of skin infections. The limited dog grooming needs of the Great Dane are therefore considered to be low maintenance, requiring limited attention to grooming with casual brushing and combing. Dog Grooming needs should also include bathing the Great Dane on a monthly basis and making regular inspections of the eyes, ears, nails and teeth. Great Dane Litter Size: The litter size of this dog breed ranges from 10-15 puppies. Great Dane puppies for sale can be obtained reputable breeders and from rescue centers. The cost of Great Dane puppies varies depending on location, pedigree history and the dog breeder. Great Dane Temperament and personality: The temperament and personality of the popular Great Dane dog breed is described as Self-assured, Confident, Devoted, Friendly and Steadfast. Great Dane Exercise Requirements - HIGH Exercise Requirements: The exercise requirements of this breed of dog is high. The Great Dane requires regular daily exercise consisting of approximately one to two hours each day. The large, powerful Great Dane has a bold, fluid, effortless gait with strides of a moderate length and requires a brisk walking speed or jogging by the owner to meet the dogs exercise requirements. Great Dane Diet: A fully grown Great Dane should be fed twice a day. A diet consisting of a premium dog food can be balanced with fresh food eaten by the family. The question is What Can Dogs Eat?. Check out our comprehensive list of what dogs can and what dogs cannot eat. Great Dane Health Problems: Potential health problems of the Great Dane breed include Cataracts, CVI (cervical vertebral instability), Hip and Elbow Dysplasia . Resolving health problems can prove to be expensive and it is always wise to obtain pet insurance or dog health insurance when buying a dog. Is the Great Dane dog breed said to be Hypoallergenic? Answer: No. Great Dane Lifespan: The life expectancy of dogs vary according to the size, breed of dog and any serious health problems. The typical lifespan of the Great Dane breed is 6-8 years. Great Dane Male Dog Names: Male Dog names are most often chosen to reflect favorite names of the owner or the strength, size, coloring and country of origin of the Great Dane breed. To give you some inspiration regarding good male Great Dane names our small selection might be of help with naming boy dogs. Our top male dog names are: Apollo *** Hooch *** Attila *** Hulk *** Roman *** Jabba *** Saturn *** Bismarck *** Boomer *** Shark *** Brawler. Great Dane Female Dog Names: Female Dog names tend to be softer, prettier and reflect the temperament of the Great Dane girl dog. Our top choice of good female Great Dane names are Bertha *** Jess *** Persis *** Hera *** Bella *** Maddy *** Precious *** Jasmine *** Lola *** Pepper.